I have always loved a well-made blazer. They can be the centerpiece of outfits. They can be versatile. They can really hold down a closet. Ever since I started wearing blazers and appreciating the construction of them, I have been in search of "the" blazer. I am sure most of you have seen the brand Veronica Beard on your feeds and through your screens. Normally anytime I lust after a well-tailored interesting looking blazer I say to myself "I bet that is a Veronica Beard". Nine times out of 10, I'm right. That is why I am so happy that after my Rent The Runway Unlimited Subscription accidentally renewed, Veronica Beard was one of the newer brands they had started to carry. Guys, $500+ is expensive and way out of my budget. BUT I can say that RTR made my dreams come true because this blazer is EVERYTHING (insert excited claps as I say everything because it felt that good wearing it.). In the week I had the Veronica beard "Moroso Dickey Jacket" jacket with me, I wore it to an important 5 times. I sported it to an important work dinner in San Francisco, to a few regular days at the office, and then again to brunch on Sunday. It made me feel so polished and feminine. 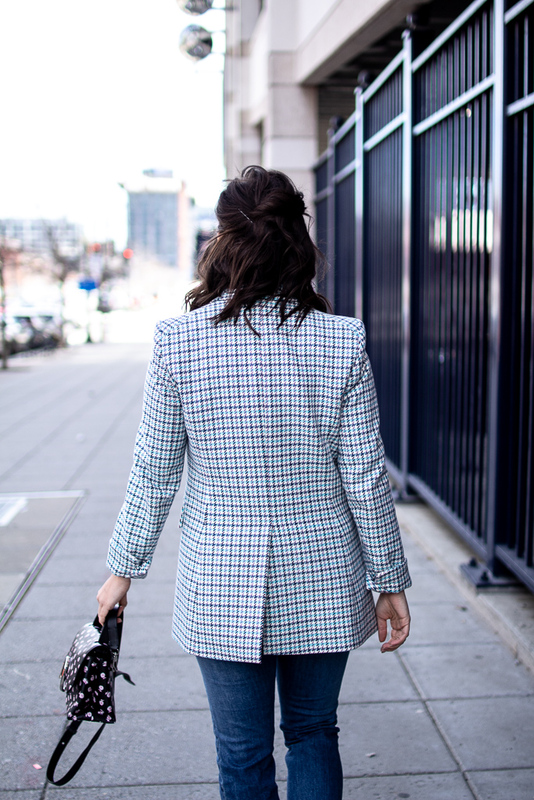 The jacket has thick material that kept me warm in the brisk 50-degree temps, the pattern is gorgeous and was the perfect color pop for me, and it paired so well with jeans, my normal bottom of choice. The great thing about this blazer is that it can be dressed up or down. Wear it with flats for a tailored casual look or darker pants and heels for a more fun professional outfit. All-in-all the Veronica beard "Moroso Dickey Jacket" is everything. I did shed a slight tear when I sent this beauty back on Monday because I really, like really, wanted to keep it. Double sigh. For reference, I am wearing a 6 and am a 34D. I was able to button the main front button but not the hidden internal one. I have a lot of great pieces from using the Rent The Runway Unlimited Subscription on and off over the last year and I have to say this may be my favorite. And Veronica Beard, I will own one of your amazing blazers one day because it did live up to the hype. If you get the chance, just rent it.